My Take on it – This is the ultimate war (anti-war) movie. Spielberg uses this picture to show the horrors of war in the most realistic fashion. This movie is a great companion picture to Spielberg previous movie, Schindler’s List (1993). Schindler shows the gruesome effect that the Nazi regime had on the Jews living in Europe during WWII and this movie shows the gruesome effect that the Nazi regime had on the allied forces who came to Europe to fight for the freedom of all peoples of the world. This movie asks the ultimate question of a soldier; how do you choose which orders to follow and which orders to ignore? This movie tried to give an answer to that question, and in this situation, it seems right, but every situation is different, so ultimately, there still isn’t an answer. The first 25 minutes of the film shows the gruesome details of the attach on Omaha Beach on the morning of 6 June 1944 (D-Day). As a former soldier myself, it is very scary to see up close and personal the effects of a battle on every day soldiers who just want to go back home alive. The movie puts us in the heart of the action and it makes the viewer feel as if he is actually there experiencing the battle with the soldiers storming the beach. This is one of those movies that makes me miss seeing movies re-released on the big screen. The sights and sounds of this movie are amazing and seeing it in a theater on the big screen with a theaters sound system is the best way to see it. When the movie was first released in 1998, a good friend of mine convinced me to see it a second time with him since it will be an experience that we would never have again. I think he was right. 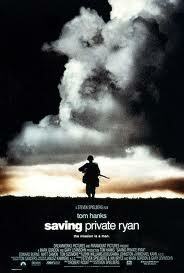 I think that most movies now-a-days don’t need to be seen in the theater to fully experience it, but Saving Private Ryan is one of the few that is best when it is seen in the theater. 15 years later, I am still amazed that Shakespeare in Love (1998) was able to trump this movie for the Best Picture Oscar. Shows that politics plays a bigger part in the awards than Cinema Excellence.